World Cup 1970 stamp design recently uncovered by BPMA. Credit: ©Royal Mail Group Ltd., 2010. Courtesy of The British Postal Museum & Archive. LONDON.- Just days before the 2010 World Cup kicks off, unused postage stamp designs from the 1970 World Cup have been uncovered by archivists at The British Postal Museum & Archive (BPMA). 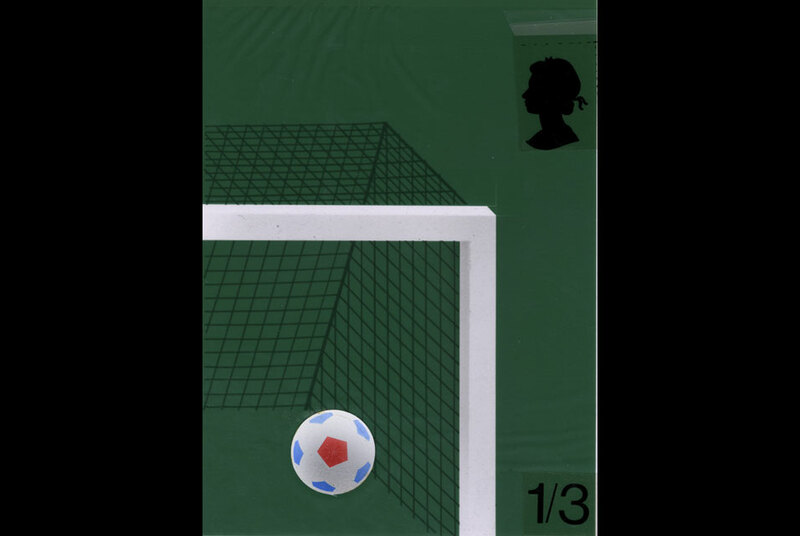 The designs, by one of the UKs most prolific stamp designers, David Gentleman, were commissioned in the event that England should have a successive World Cup victory following its win in 1966. The find comes half way through the London 2010: Festival of Stamps. Its thought that David Gentleman was briefed to prepare the 1970 designs after the more hasty production of the celebratory stamp for the World Cup four years previously. Although the Royal Mail had produced a hugely popular set of stamps to mark Englands hosting of the World Cup in 1966, when the national team won, there was only time to modify the existing stamp with the words ENGLAND WINNERS to celebrate the triumph. Jennifer Flippance, exhibition manager for the London 2010: Festival of Stamps said: Royal Mail was obviously determined to be more prepared in 1970 which is why it commissioned designer David Gentleman. Its only a shame that England didnt experience the same victory in 1970 and that the stamp designs were filed away and forgotten. She continued: Its particularly exciting to find these designs during our London 2010: Festival of Stamps  a year long programme of exhibitions, event and activities, aiming to showcase, celebrate and raise public awareness of stamps, stamp design and postal heritage. The BPMA holds all the original artwork for both the 1966 stamps and the unseen 1970 stamp designs and they present a fascinating picture of the design and approval process for new stamps. Those who would like to see the stamps and the designs may visit The British Postal Museum & Archive - see http://postalheritage.org.uk/visiting for details. Photography exhibition reveals life in India's coal belt at London's Gallery S O.